The Staybridge Suites Colorado Springs is a new all-suite hotel designed to let travelers feel more comfortable than ever. Each suite in the hotel is designed for maximum flexibility and adaptability to meet individual needs. The studio, one-bedroom and two bedroom/two bathroom units feature fully-equipped kitchens complete with all the utensils you will need. Separate living and work areas, spacious living area offering comfortable furniture, 27' TV with HBO and pay per view. Work area is well lit with an expansive desk and ergonomically designed seating, available high speed internet access, two phone lines with a direct dial phone number and personalized voicemail, ample closet space and storage areas, library with computer terminals, complimentary guest laundry and fitness center, outdoor pool, whirlpool and sport court. The hotel offers Complimentary Breakfast Buffet and evening Sundowner Receptions midweek. Located in the Northwestern section of Colorado Springs near the Air Force Academy with numerous dining options within walking distance. The hotel is located just minutes from Garden of the Gods, Air Force Academy Chapel, Royal Gorge, Pikes Peak, Seven Falls, Flying W Ranch, Lockheed Martin, Stellent, Fluke, Oracle, Hewlett Packard, Intel, Focus On The Family, Ford Motor Credit, Federal Express, Mitsui Advanced Media, Quantum Corporation and Boeing. 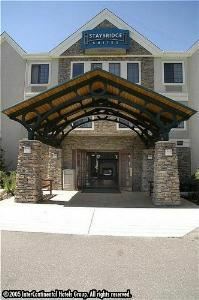 The hotel is located just minutes from Chapel Hills Mall and downtown Colorado Springs.